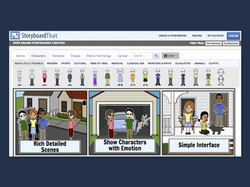 "Storyboard That is a storyboarding tool that offers templates for students to create stories. This site offers scenes, characters, text bubbles, and much more to fill the storyboard frames. Need to outline a story, plan out an idea in a fun way; break down or plan out, Storyboard is a great way to do just that." Storyboard That® was named one of the Best Websites for Teaching and Learning by the American Association of School Librarians, a division of the American Library Association.